The sky as we drive East towards tiger country. We awake yet again bright and early for yet another adventure. Our only saving grace for the day was that we got to sleep an extra hour due to daylight savings time. We went through the all too familiar steps of dressing in the dark and leaving before the sun rose. Ryley was becoming good at dressing quickly and falling back asleep as I pulled out of the driveway. This is not how I envisioned I would be spending a Sunday morning in November. But when an opportunity presents itself you grab a hold of it and hold on for dear life, because you never know where you might end up. And so it was no different this Sunday morning, except for the later than normal start. An opportunity had presented itself; an opportunity for redemption. It was literally time to hold on for dear life because today we were going on a hunt; a hunt for a tiger. Ryley and Mark with their 53 inch muskie. A few months ago our friend Mark Modoski reached out to me asking if I still had any digital pictures from our muskie trip from last November. I replied by forwarding nearly every picture I had taken that day. He alluded to a story he was doing about fishing in New Jersey and that he might be able to use one of Ryley. About two weeks ago Mark made good on his promise and published an article in On The Water magazine about the awesome fish hatchery they have in New Jersey. 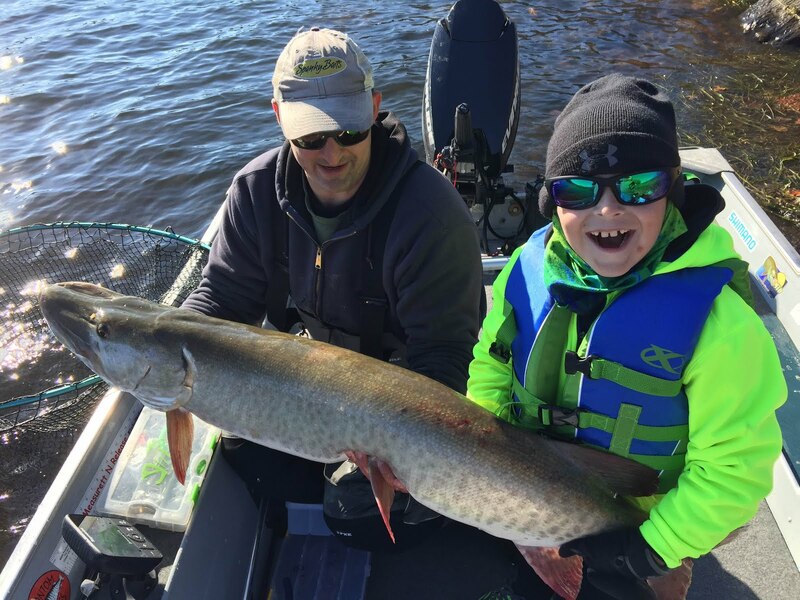 At the end of the article was a paragraph or two about our muskie trip last Fall and our quest to fill a vacant IGFA small-fry tiger muskie record. It was humbling to think about all the work the hatchery put into breeding and raising a small muskie which was released into a lake in northern New Jersey that grew into the 53 inch monster Ryley caught. Little did I know that the failed quest for an IGFA record would lead us on a whirlwind of fishing adventures this past year and bring us full circle back with Mark, nearly a full year later, out on the water in search of our record again. This time we were more prepared for what might come our way. Mark had the weigh-sling, I had an IGFA certified scale, IGFA measuring tape and the necessary paperwork to seal the deal. We were fishing on a different lake, in Pennsylvania, that only had tiger muskies and no pure strains. All we needed to do was find a cooperative tiger muskie; just one. Our plan was simple. We would through everything, including the kitchen sink, at these muskie in hopes one of them would fall to temptation and find its way into our net. We would again be trolling live rainbow trout, casting large swim baits as well jigging in deep water. The weather conditions were less than ideal but we were confident that we would be able to put the bait and lures in their faces and hopefully get one to bite. Our less than optimal fishing conditions; bluebird sky and high winds. Why is it that weatherman can even find a job these days? They are all-too-often completely wrong in their assessment of the weather. During the week leading up to our trip I saw forecasts that said Sunday was going to be overcast with light winds, forecasts that said it was going to be partly clouding with moderate winds and even one that said it was going to be sunny with high winds. With the way our luck ran with our bear hunt I was convinced that we would have the worst weather possible for our trip. Sadly I was right. Despite the weather, which turned out to be bright sunny skies with high winds, we left the boat launch optimistic. We had an arsenal at our disposal and we were prepared to use it all against these tigers. I’m not entirely sure if I had explained this previously when I wrote about our first fishing trip with Mark, but he has a rather small boat; a 14ft sea nymph. The conditions on board are quite cramped for two adults and a small child but we manage to make it work. As we left the boat ramp I was slightly concerned with the wind and how it would affect the chop on the water. Luckily the wind wasn’t much of an issue safety wise but it sure did blow us all around that lake! You can JUST make out the orange bobber we used to troll our trout with. As we trolled our way around the lake we came upon a spot Mark called “muskie alley”. This was a small sheltered cove at the back on the lake which had a high steep bank but relatively shallow water. The winds weren’t hitting the water as hard hear so we decided to pull out a swim bait and do some casting as we trolled. As we left “muskie alley” for our drift back towards the boat ramp we still felt like we had a chance at catching a muskie. We still hadn’t used all of our weapons and it wasn’t even prime muskie feeding time yet. Ryley casting a swim bait. As we drifted we decided to troll a rainbow trout off the bottom (we were already floating on near the surface on a large bobber) in about 25 ft of water and switched out the swim bait for a jigging lure. The jigging lure came up empty like the swim bait had but we saw promise in the erratic behavior of the rainbow trout as we trolled it on the bottom. For a brief few moments it would start to pull line out and it frantically swam in one direction, as if it were being chased by something. We gave it a few minutes each time and then hauled the trout back to the surface to see if it had been hit by a muskie. Each time we were a little more disappointed than before when we saw no signs of a muskie. For the next 8 hours we trolled, drifted, jigged and cast our butts off. We saw lots of baitfish and some nice marks on the sonar but we never managed to move a muskie or get one to take one of our rainbow trout. But all was not lost. Mark and I both talked to Ryley and he wasn’t upset at all. Despite the cold the wind and the lack of fish he said he had a good time fishing. He also came out with more prophetic words as we headed back in for the day, “That’s why they don’t call it catching”. He wasn't real happy with me taking his picture, can you tell? As we packed up our gear and helped Mark with the boat we talked more about the record that has eluded us for over a year now. It dawned on me then that time was running out on us. By this time next year we would be out of luck. Ryley would need to catch his tiger muskie before he turned 11 next September. As we departed Mark offered up to take Ryley out next May or June and if that didn’t work he would try for early September. It seemed after this trip we were all just a little more committed to getting Ryley that tiger.